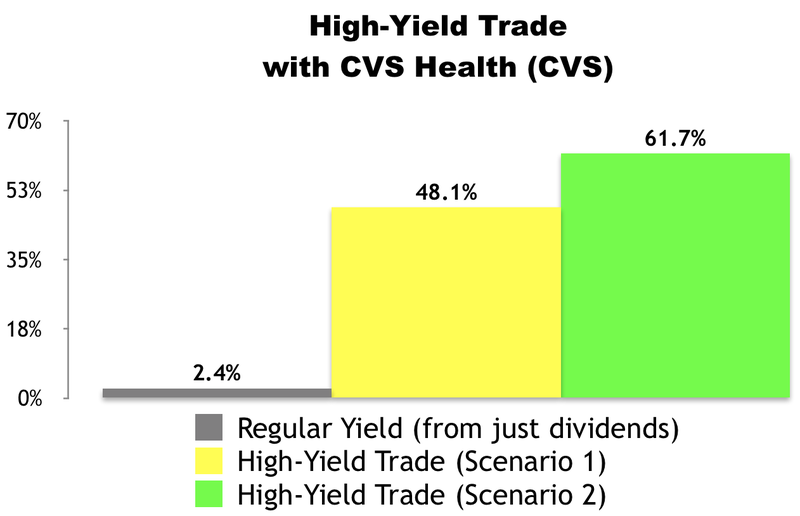 Back in July, we introduced you to a high-yield trade with CVS Health (CVS) that was poised to deliver a 19.9% to 32.4% annualized yield. If you made the trade, congratulations: the options contract you sold likely expired worthless on August 25 and you booked a 19.9% annualized yield. Ideally, you would have already sold another round of calls after the last contract expired. You would have used the $78 strike price again with the September 22 expiration date. If you did this, your shares would have likely been called away (since the stock was trading above $78 after close of bell on Friday). The trade would be closed and you would have generated both call income and a capital gain. If you’re in this camp, we don’t have a new trade for you today. Sit on your cash for now. If you didn’t sell another round of calls last month, and you’re still holding shares, consider selling another round today. For example, if you previously bought under $78 per share, then consider selling a call now at the $78 strike price with an expiration date of October 27, 2017. That will give you tremendous income today, set you up for a dividend payment, and still ensure a capital gain if shares get called away at expiration. As we go to press, the October 27, $78 calls for CVS are going for about $3.25 per share. Our trade would involve selling these call options. If CVS is trading under $78 on October 27, our options contract would expire and we’d continue to hold our shares. In the process, we’d receive $325 in premium ($3.25 x 100 shares) for every contract sold. Excluding commissions, if “Scenario 1″ plays out, we’d receive a 4.2% yield for selling the covered calls ($3.25 / $77.08) in 32 days. That works out to a 48.1% annualized yield. If CVS stays over $78 by October 27, our shares will get sold (“called away”) at $78 per share. In “Scenario 2” — like “Scenario 1” — we’d collect an instant $325 in premium ($3.25 x 100 shares) for every contract sold. We’d collect this income when the trade opens. We’d also generate $92 in capital gains ($0.92 x 100) when the trade closes because we’d be buying 100 shares at $77.08 and selling them at $78. In this scenario, excluding any commissions, we’d be looking at a $417 profit. From a percentage standpoint, this scenario would deliver an instant 4.2% yield for selling the covered calls ($3.25 / $77.08) and a 1.2% return from capital gains ($0.92 / $77.08). At the end of the day, we’d be looking at a 5.4% total return in 32 days, which works out to a 61.7% annualized yield from CVS. We’d place a “Sell-to-Open” call option order with a limit price of as close to $3.25 as we can get — the higher the better. The expiration date we’d choose is October 27, 2017.